What does unlevel buildings mean? Unlevel buildings are the result of weak ground and/or subsidence. The appearance of internal or external wall cracks, inability to open and close windows and doors, cracked floors and more can all signal an unlevel building. Once a building becomes unlevel, it is important to fix it right away, or risk further damage and potential hazards. This requires foundation repair, footing repairs, and house re-levelling. A loss of ground moisture, such as in drought conditions, can cause buildings to subside and become unlevel. The weight of the building causes it to sink, but the nature of soil and clay shrinkage is that the foundation subsidence is never usually uniform. Loss of support varies across the structure, often causing cracks to form. Often, as the soil or clay becomes moist again and expands, some of the damage may be reversed. However, without ground compaction, all wall cracks are prone to reopen with the next extended dry period. Earthquakes can cause unlevel buildings and soil liquefaction, which makes previously-stable soil behave like a liquid, causing buildings to become extremely unstable. In many cases the damage that caused the building to become unlevel happens over very long periods of time, making it difficult to pinpoint the exact cause. Regardless of the cause, subsidence repair is possible, and unlevel buildings can be re-levelled and re-supported. How to fix unlevel buildings? Mainmark specialises in raising, re-levelling, and re-supporting unlevel buildings by treating the foundation subsidence beneath them which, in turn, allows for the foundation slab to return to level. For example, we can inject structural resins into the foundation ground under the building’s footings for foundation repair and footing repairs. The resins expand together chemically, creating pressure. That pressure lifts the building back to its correct level. Then, if there are weak layers in the ground, continuing injection at deeper levels can resolve this by compacting the ground, densifying and strengthening it to increase its bearing capacity for the future. Alternatively, we can undertake JOG computer-controlled re-levelling. Extremely successful in subsidence repair, this award winning method was used to relevel the Christchurch Art Gallery after it suffered building subsidence following an earthquake. JOG is a computerised level correction system that involves, in sequence and rapid succession, grout injection via multiple injection ports. This creates multiple localised hydraulic forces, strategically-arranged over large areas, to effectively float a structure back to level. In some soil conditions, Mainmark can increase the bearing capacity of weak strata by as much as 500 per cent. 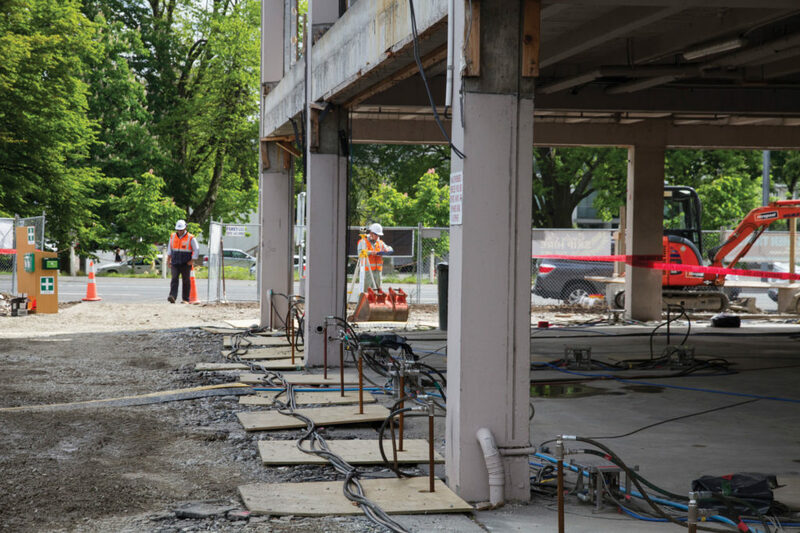 Mainmark’s concrete slab levelling methods are fast, efficient, and cost effective; they don’t require you to vacate the building while work is being done. Mainmark offers the most advanced technology for house re-levelling and underpinning. We raise and re-level sunken buildings, then add underpinning footings to support the ground underneath to strengthen the house footings. We have successfully raised, re-levelled, and re-supported thousands of homes around the world. We visit your home, assess the damage, and discover the cause. Our experienced engineers and technicians establish the approach needed, creating a plan specific to the needs of your house. As the house is brought back to level, underpinning footings are corrected, sunken floors are raised, and any internal and external wall cracks generally close up too. Most importantly, structural damage is resolved and, with a stable foundation, the future of the house is sound. Our solutions for concrete re-levelling, footing repairs, and foundation repair under houses are cutting edge and are a more modern alternative to the traditional way of concrete underpinning. Our alternative technologies are likened to keyhole surgery as the as the injection holes are often as small as the size of a five cent coin. These solutions are not just for concrete slab floors. We can raise, relevel and re-support strip footings, raft slabs, and ‘waffle-pod’ slabs, plus we can infill slab driveways and paths. We offer a range of technologies for strengthening foundation ground and house footings, and re-levelling homes, such as our proprietary Teretek engineered resin solution. The resins and hardeners mix together in the ground, and expand to compact the adjacent soils and increase their load-bearing capacity. This corrects building subsidence even in weak soils. We also offer JOG Computer-Controlled Grouting, which is a computerised level correction system. It involves injection of grout, in sequence and rapid succession, via multiple injection ports. This underpinning method creates many localised hydraulic forces, strategically-arranged over large areas, to effectively ‘float’ the structure back to its design level without using traditional piles or hydraulic jacks. The products and techniques we use have zero negative impact on the environment.